Do You Serve Wine At The Correct Temperature? Most Don't. Cold Chardonnay Bottle. Should It Be That Cold? The world is full of things that are fantastic when served at the right temperature and revolting when served at the wrong temperature. Does the thought of hot mayonnaise appeal to anyone? How about cold scrambled eggs? Lukewarm sushi anyone? There’s a dirty little secret in the wine world that not enough people know about. Americans almost always serve white wines too cold and red wines too warm. Most wines were meant to be served at just below to just above cellar temperature, and the optimum serving temperature for wines depends on the type of wine. By serving them at the wrong temperature, we seriously mess with the flavor. Don’t believe me? Try this experiment. Place a bottle of Chardonnay in the refrigerator for at least 4 hours so that it’s good and cold. Make sure the Chardonnay was made with oak (it doesn’t have to be a heavily oaked Chardonnay, but one kept only in stainless won’t illustrate this point as well). Once it’s at refrigerator temperature, pour a glass and take a small sip. Now put it in the microwave for 3 seconds (sorry connoisseurs but this is for science). Try another sip. This can be repeated several times before the wine get too warm…roughly 60 degrees. The taste and structure of the wine should change noticeably with every 2 to 3 degree increment and it should get smoother and more complex as it reaches the low to mid 50s. Specific wines should be served within specific temperature ranges. Chardonnay in particularly is probably the most victimized wine on the planet. Have you ever heard this one a restaurant? “Oh waiter. My Chardonnay isn’t cold enough. Could I have some ice to put in it please?” The thought of it makes my skull ache and I feel a rant coming on so you’ll just have to bear with me. First, don’t ever put water in your wine (and please don’t tell me the offender above didn’t put water into the wine, only ice). Ice is frozen water and you don’t need to be Einstein to realize that. Water in any form, not only dilutes the wine, but it also changes the PH. Wine is acidic – water is not. Acid in wine is one of wine’s predominant flavor components. Putting water of any type into wine seriously messes with its flavor. Second, just because a wine is white, does not mean it’s meant to be served at fridge temperature. In fact, there are more white wines that should be served above fridge temperature than at fridge temperature. Troglodytes that insist on chilling every wine to a temperature only a penguin in a blizzard could enjoy should be barred from ever drinking wine again. Ok… that was only a minor rant so back to our regularly scheduled wine post. White wines, except those made to be served very cold, should be removed from the fridge prior to serving. Wines designed to be served at cellar temperature like most reds and several fuller bodied whites can be brought to the correct serving temperature by placing them in the freezer for a short amount of time. Your refrigerator and freezer are tools so don’t be afraid to use them. The infographs below provides general guidelines to get your wine to the correct serving temperature. All freezers vary in temperature and most have cold spots, so customizing the table to fit yours will likely be necessary. In particular, avoid putting a bottle of wine directly under the cold air vent, which will chill the wine down too quickly which seriously screws with your ability to judge how long to keep it in the freezer. Whether you are starting with a room temperature wine or a wine from the refrigerator, the infographs below will help you estimate the time needed to get it to the perfect wine serving temperature. 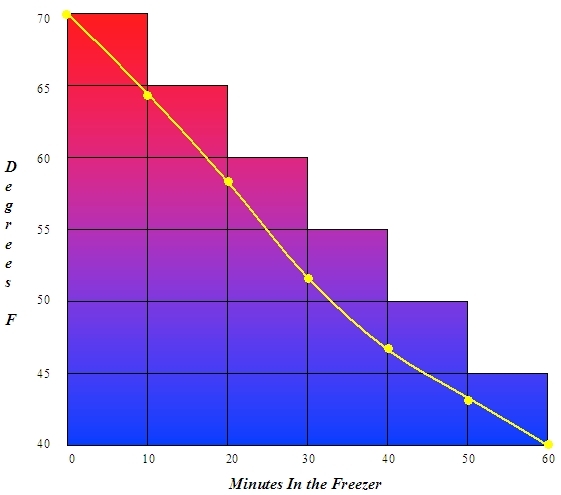 Infograph – How Long Will It Take to Chill Wine In A Freezer? 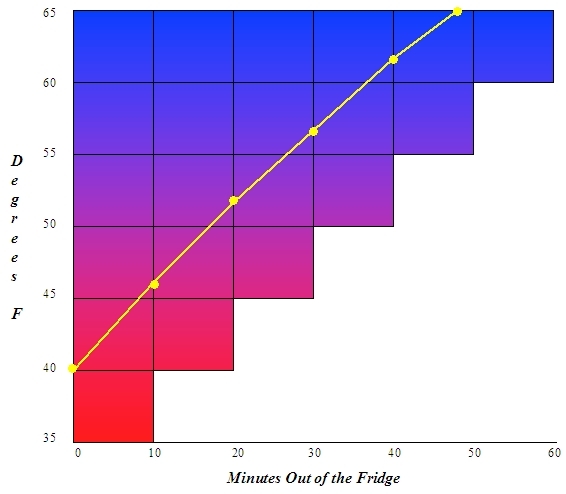 How Long Will It Take to Warm A Refrigerated Wine? There are also several devices that are designed to coax your wine to the correct temperature. One that we tired, the wine waterfall worked to a degree but had a few drawbacks. Feel free to read a review of it here. Once you have a wine to the right serving temperature, keeping it there is also important. Unless you are going to pour the entire bottle at once, use a chilled stone (or ceramic) holder to help keep the wine at the correct serving temperature for a longer period of time. What’s the best way to chill it? Just keep it in the freezer for when you want it. 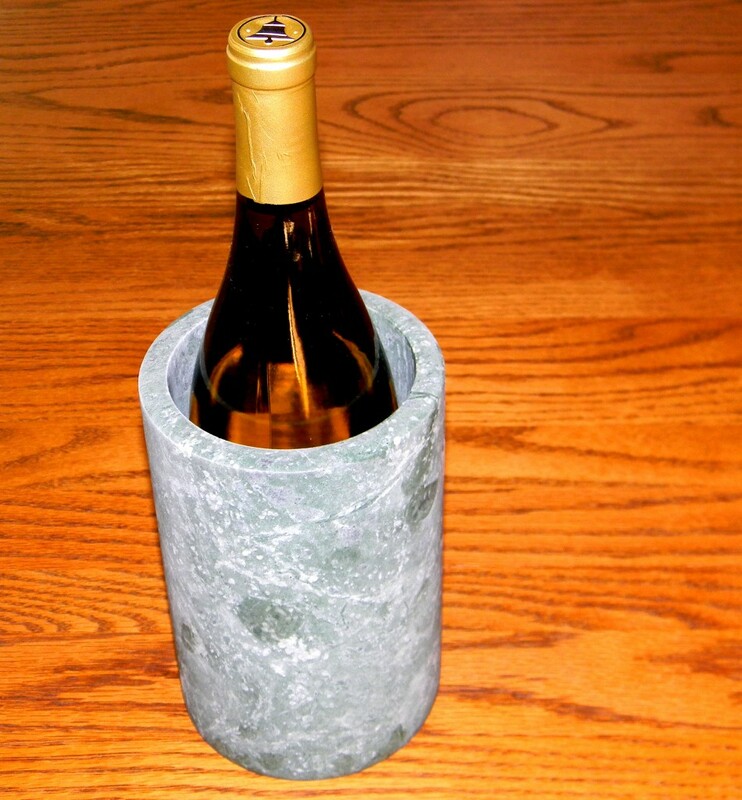 The wine holder is a large thermal mass, surrounding the wine with cooler temperatures than the ambient room temperature. It will help slow the warming process much as a foam cooler does for a bottle of beer (man can’t live on wine alone). It also helps to drape a damp dishtowel over the bottle and the stone holder to further slow the warming process. Can any white wines be served at refrigerator temperature? Yes, crisp white wines like Pinot Grigio and Riesling should be served at refrigerator temperature. 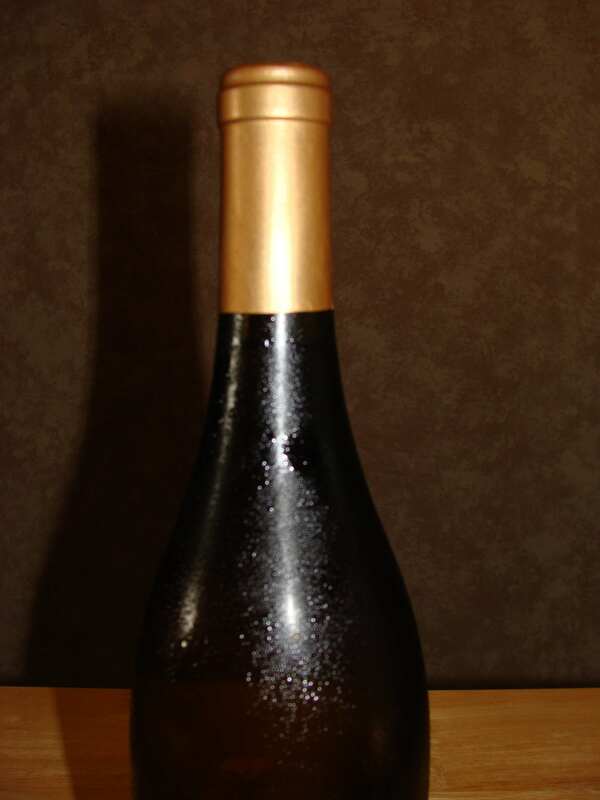 Most sparkling wines are also served at or very near fridge temperature. The ideal temperature should be in the low 40s F.
At what temperature should lighter red wines be served? The reverse applies to red wines. They’re almost always served at room temperature but that’s not correct. Lighter red wines like Pinot Noir should be served at or near cellar temperature, usually about 58 – 60 degrees F.
At what temperature should heavier red wines be served? Merlot, Zinfandel, Cabernet Sauvignon and Syrah should be served around 62 degrees F.
If you are going to spend money on buying good wines, you really should maximize your investment by following these simple steps to show your wine at it’s best. If you are just going to serve it right out of the fridge or at room temperature, your aren’t going to get the full value of your investment.